Will You Help AMERICORPS ALUMS Launch ServeAYear.org? 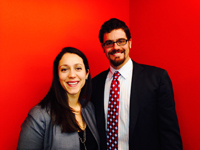 AMERICORPS ALUMS Co-Executive Directors Mary Bruce and Ben Duda are playing a leading role in the campaign’s launch. Today, AMERICORPS ALUMS joined with ServiceNation and 17 of the country’s leading national service organizations in an effort to make a year of service part of the American way of life. To learn more about our efforts, check out the campaign website: www.serveAyear.org. Learn more about the campaign here. AMERICORPS ALUMS serves as the National Strategic Partner for this campaign, highlighting the power of national service to be a cross-cutting solution for our country’s most pressing problems by uniting Americans in common purpose. Nearly 820,000 Americans have served in AmeriCorps over the last 20 years and through this historic campaign, we will showcase how these AmeriCorps alumni are still “getting things done” with more impact than ever before. Find out who else is working with us on this historic campaign. Over the next three years, ServiceNation will lead this initiative, engaging entertainment companies and TV show executives in an effort to integrate powerful stories of service by AmeriCorps members and alumni into the scripts of their shows. Only two weeks ago, AmeriCorps was mentioned in an episode of HBO’s True Detective, a direct result of this effort. In the coming months, the campaign plans to roll out other partnerships with humorous digital platforms, YouTube stars, social-minded brands, athletes, celebrities and more successful integrations that will help tell the story of national service in America. We also want to hear from you — share this exciting news with your friends and family on social media using the hashtags #serveAyear and #alumsnow. Tell us what you think or if you have a great idea about how AmeriCorps or AmeriCorps alumni could play a role in your favorite show. Enter your email address to get blog updates sent to your inbox.